Italian food is one of my comfort foods. But, I grew up surrounded by Italian-Americans who cooked southern Italian cuisine. Northern Italian food, though, is so different than what I grew up with. And, some of the best northern Italian cuisines can be found in the Piedmont, Italy, region. We are going to share what makes Piedmont food so good, and so different from other Italian cuisines. Understanding Italian food by region is important. There are so many different types of cuisine depending on where in the country you travel to. In my opinion, there is no such thing as a “food capital of Italy.” Piedmont recipes are going to be entirely different than recipes from Rome, or Florence, or Sicily. And, a big part of this is because of the key ingredients that the Piedmont region is known for. In this Italian food blog post, we talk about the food in Piedmont, and why it is so tasty. The first thing to understand when learning about the food and wine of the area is to define Piedmont. It’s not an Italian region that is as well known as other areas of Italy, like Tuscany or Umbria. First off, what is the difference between the Piemonte region and the Piedmont region? That’s a simple one. Piemonte is the Italian spelling and Piedmont is the English spelling. In this post, I might use both versions interchangeably. The Piedmont area is located in the northwest corner of Italy. The capital of Piemonte is the city of Turin, which is known as Torino in Italian. Some of the other major cities in Piedmont include Alba and Asti, as well as the tiny village of Barolo, well known for the best Barolo wine. What is perhaps less known about Piedmont are the Italian dishes of the area. They are not necessarily as well known as some of the dishes and food products from other areas of Italy, like lasagna from Bologna, or Parmigiano Reggiano from Emilia Romagna. But, the Italian dishes from the area are very good. This is mostly due to the high quality of the Piedmont food products available. While visiting Piedmont, and staying in Barolo, we sat down with dozens of Piedmont food producers to learn all about their quality products. Then, we traveled to Turin to learn (and eat) more Turin cuisine. While in Barolo, we stayed at Hotel Barolo, a simple, classic Italian hotel, in the middle of the vineyards. Get the best price on Hotel Barolo here. The Piedmont region is most famous for wine and chocolate and hazelnut products, like Nutella. But, the region is not known as much for its cheese or other products. And, it’s not as well known for its Italian cuisine. But, from what we learned about Piedmont food when visiting Barolo and Turin is that some of the most high-quality Italian food products are from the area. We learned so many Italian food facts while in Piedmont. Assopiemonte is the consortium of Piedmont food producers, founded in 1989. Like in Emilia Romagna, and elsewhere in Italy, the consortium regulates the agriculture process and quality for DOP and IGP products. It also helps to promote Piedmont food and wine through Italy and around the world. The Assopiemonte consortium focuses on the promotion and quality of three primary products: 1) Piedmont cheese; 2) rice; and 3) Piedmont meat. They work on other products as well. They not only promote the products but to help promote and support smaller family estates that wouldn’t otherwise be able to promote their own products. They offer technical support as well, to keep standards and to help smaller producers modernize and to ensure consistency. It’s one of the reasons why Piedmont food is so good. People may think that pasta is the national food of Italy. But, when you think about it, most signature Italian dishes are actually made with cheese. And, almost every Piedmont restaurant menu includes all sorts of dishes featuring some of the most prominent Piedmont cheeses. Now for a little cheese nerd history. Cheese production started in Piedmont with the first documented production in the 12th and 13th century. At that time there was evidence that cheese was used as a payment to the Marquis. In the 14th century, the first treatise of Piedmont cheese was published, which covered how the cheese is made, consumed, and how to produce milk. It sort of codified cheese culture and cheese production. Piedmont Italy is a very mountainous region, which gives the cheese a unique character. The cows graze up and down the steep Alpine mountainside, constantly in search of grass to eat. There are about 2000 farmhouses or barns, with cows that produce milk. Of those, about 600 produce cheese, most of which are found quite high in the mountains. There are many different types of cheeses produced, but one reigns supreme. Wondering how to eat Piedmont cheese? Look for pasta and risotto dishes with cheese, like Risotto Alla Toma Piemontese. We had a great version at Villa Prato in Piedmont. La Villa Hotel is amazing, with one of the most beautiful spas I’ve ever seen. Book La Villa Hotel at Villa Prato for a luxury villa experience starting at $300 a night. 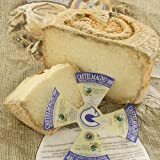 The self-proclaimed ”king” of Piedmont cheese is Castelmagno, which comes in two varieties, Castelmagno DOP and Castelmagno di Alpeggio DOP. Both kinds of cheese are made with the simplest of ingredients, milk, salt, and rennet, but the latter being from the Alps. Although not to get too confusing, the Castelmagno DOP is also referred to as from the mountains, which it is, it’s just not as Alpine as the Alpeggio. Welcome to the world of Italian DOP and IGP products! And Castelmagno is one of the key components of Piedmont cuisine and is probably the most well-known of the Italian specialty foods from Piedmont – at least to those in the know. Prior to spending this week in Piedmont, if someone asked me what food is Italy known for, I never would have said Castelmagno cheese. But, I spent much of the week in Barolo sitting next to a chef from New York City, who has worked with some of the top chefs in the world, including Wolfgang Puck and Daniel Boulud. He knew Castelmagno quite well, which just makes me understand how little I know about the products of slow food in Italy, even after writing a book about Italian food. The Alpeggio cheese is produced high in the Alps, with the cows grazing over 1,000 meters high. The cows must only eat grass from the Alps in order to be called Alpeggio. The cheese also must be aged a minimum of 60 days to be called Alpeggio. It’s often called a “green cheese” style blue cheese, one of the most expensive in Italy. The Castelmagno di Montana DOP (so not Alpeggio) is similar but produced in a lower altitude. Wondering how to eat Castlemagno? It’s common on pasta and risotto dishes. Try the Tajarin al Castlemagno at Porto di Savigno in Turin, one of the best meals we had while in Turin. Tajarin is a ribbon-shaped pasta, similar to tagliatelle, but thinner. Look for restaurants that show “fatti in casa” or made in-house. Many northern Italian dishes feature Castelmagno cheese. Some of the younger Castelmagno is quite crumbly to the touch and is good for cooking. This is why it is found as an ingredient in so many northern Italian pasta dishes. It works well with gnocchi or on risotto. The younger cheeses can be paired, of course, with Barolo wine. The more aged cheeses can be paired with passito, a sweet wine. It’s Possible to Purchase Castelmagno DOP cheese on Amazon! Castelmagno Dop - 1 Lb - 16 Oz. When thinking about famous Italian food, many people don’t think about hazelnuts. But one of the most popular Italian food items around the world has to be Nutella, the chocolate hazelnut cream. It’s important to know, though, that in the Piedmont area of Italy hazelnuts are not only very important, but there is more to the world of hazelnut chocolate than Nutella. Hazelnuts in Piedmont are a certified IGP product, officially known as Nocciola Piemonte IGP. Yes, there is a consortium that regulates hazelnut production the same way that they regulate Prosciutto di Parma. Many of these producers (like Cascina Valcrosa, and Terra delle Nocciole) produce raw hazelnuts, roasted hazelnuts, and a variety of other products, like hazelnut paste and hazelnut chocolate cream. These are the types of products you might find at a luxury food shop or even a Piedmont farmers market. They also make sweets and cakes with hazelnuts that are unlike anything else in the world! They are real products, with no preservatives or extra ingredients. Their hazelnut paste is just crushed hazelnuts and is great for cooking. We’ve used it to make pasta with hazelnut cream sauce. Their hazelnut chocolate is sublime, with a creamy texture that is a world away from Nutella. Yes, Nutella is a Piedmont product, but it is one that is filled with extra sugar and oils. All their products are made with Nocciola Piemonte IGP. They are part of the Consorzio Tutela Nocciola Piemonte, who regulates the quality of the Piemonte hazelnuts. Not only can you find these products on Piedmont restaurant menus at some of the best restaurants in Piedmont Italy, but it’s also possible to find IGP hazelnuts in some of the most high-quality gelato flavors around Italy. We first started to learn about Italian craft beer while visiting Eataly World in Bologna. I’m going to be honest. When we travel to Italy, I drink Italian wine, almost exclusively. But, I am starting to develop a taste for craft beer. This after doing a good amount of craft beer research during our US road trip, as well as learning more about craft beer in the Costa Brava. And, the Italian craft beer scene is developing, as these beers go well with local Italian food. We learned a lot from some of the top Piedmont craft beer producers. And, much like craft beer is known as cervesa artesana where we live in the Costa Brava, in Italy, craft beer is known as birra artigianale. We met two birra artigianale producers in the Piedmont region. La Alabuna started in 2013. The name of the beer comes from the local Piemonte dialect for a word that translates to genuine or down to earth. Both Kauss and La Alabuna produce more blonde beers because that is what the Italians prefer. La Alabuna’s goal is to work with their customers to meet the needs, and most important, tastes, of the local market. They actually produce at the same brewery as Kauss. I am sure there is a little bit of competition, but it is good to see the cooperation between the two breweries because they have the ultimate goal – to spread the word about Italian craft beer. And, after meeting these Italian craft beer producers and tasting all of their beers, we got to hang out with them, drinking, of all things, Piedmont sparkling wine! Growing up in the US, I really only knew rice as Uncle Ben’s. But, as I learned more about food, I learned that there are difference kinds of rice for different uses. I understand that it is a good idea to use Arborio for risotto, basmati for Indian food, and there is a Catalan bomba rice from nearby Pals that we use in Girona. Piedmont is the best region in Italy for food if you love risotto. And, that’s all because of Piemontese rice. There are over 200 different rice varieties in Italy, but yet most people only recognize the name Arborio. There are six different rice varieties within the category of Arborio within Baraggia, the Piedmont region that produces rice. There are seven rice varieties grown in the area, and yes one of the most well-known varieties being Arborio, but there is also Carnaroli. And, there is a Piedmont rice history – people have been cultivating rice in Baraggia since the 1400s. And, is there any surprise that Baraggia rice is a DOP product? At this point, there should be no surprise. Having the DOP designation offers full traceability, from cultivation to the shelves. The farmers and the millers work together to produce the best quality product. And, it’s the only DOP rice in Italy. There is even something called a “rice sommelier” who recommended that the Santa Andrea rice is the absolute best for risotto because it is better adapted to the cold weather and the rice offers a lower viscosity. Who knew? But, what I learned first and foremost while traveling in the Piedmont region of Italy is that risotto, made with Baraggia DOP rice, is the epitome of Piemonte cuisine – particularly when served with DOP Castelmagno cheese! Within Assopiemonte, there is also an association of Quality Meats, focusing predominantly on protecting traditional breeds of Piedmontese beef. It’s one of the newest associations, being formed in 2001. There are over 800 livestock rearers in Piedmont, most of them that are very small productions of Piedmontese meat. There are both pure Piedmont races, and other cow breeds as well. It is the second region in Italy for meat production. There is more beef produced in the north of Italy because there is a higher amount of grain production, so the cows have food to eat. This means that Piedmont beef is commonly found in Italian meat dishes. It’s possible to find the Piedmont beef in restaurants or small butcher shops within Italy. They only export about 1% of the beef, mostly to France. This actually means that if you see “Piemonte beef” in the US, on restaurant menus, for example, it is a Piedmont beef breed that is then raised in the US. It is not meat imported from Italy to the US. That makes this one of the most native Italian foods in that it is pretty much only found in Italy. Because the Piedmont beef is so lean, like the Italians like it, it shows up in a lot of Italian raw beef dishes. I know that Italian raw meat can be tough to eat for many Americans (and others) but the meat is tasty and even healthy. That said, we ate a raw beef appetizer of Piedmont beef. We tried a lean meatball, almost like a tartare, but without seasoning, that was made from the thigh meat of the cow. We also tried a super unique salsiccia di Bra, which is a sausage that is never cooked. Instead, it is seasoned, and eaten raw, more similar to a traditional tartare. This has to be a unique food to track down when traveling in Piedmont Italy. I will say I liked the sausage a lot more than the meatball. Piedmont Food Pro Tips: How to try Piedmont beef in Italy:Look for Vitello Tonnato, or a sliced piece of Piedmontese beef, served rare, with a tuna sauce. Or, La Battuta di Fassona, which is a raw beef dish, similar to a tartare. Both are very tasty. Where is the Piedmont Region? Piedmont is in Northwest Italy, where it borders France and Switzerland. As a frame of reference, Turin is about 7 hours drive, or less than 5 hours by train, from Rome, which is the capital of Italy. It’s only an hour by train from Milan. How many Michelin Star restaurants are there in Piedmont? Italy hosts loads of Michelin restaurants. Italy doesn’t have the most of any country, but they certainly have a lot. Piedmont hosts approximately 40 Michelin Star restaurants, including 9 in Turin and the surrounding area, and some of the best restaurants in Alba Italy, including Ristorante Piazza Duomo. Who are the best Barolo producers? When it comes to wine, the “best” really depends on each person’s tastes and preferences. That said, some of the most awarded and most recognized are Bruno Giacosa, Enrico Rivetto, and Massolino, among others. These are some of the best wineries to visit in Piedmont. This is certainly an ultimate guide to Piedmont food and Piedmont cuisine, with a focus on the Piedmont agriculture products. Sure, it’s possible to find some of these products in the US, and around Europe. But, many of the Piemonte food producers we met are more artisan, smaller producers. So, to taste a lot of these Piemonte foods, you need to travel to Piedmont! A lot of these Piedmont foods can be tasted in Turin, Alba, and Asti, but Barolo is also a good place to learn more about Piedmont cuisine. We were invited by AgriLab, which is surrounded by the Barolo vineyards, to participate in Collisioni, an annual food, wine, and music festival held in the tiny village of Barolo each summer. That meant we got to eat tasty Piemonte food and local food products, and we got to enjoy an intimate evening with Depeche Mode. AgriLab runs a Piedmont wine center, where it’s possible to do a Piedmont wine tasting and purchase local food products, all within a few feet of the Barolo Castle. The wine center offers a good selection of Barolo Italy wine and it’s possible to purchase a card that allows for a series of Piedmont wine tasting options. There are so many great options for food and wine tours in Italy, particularly in the Piedmont province. Food tours are such a great way to learn about regional Italian cuisine and local wine from local experts. Included below are recommended Piedmont food tours, including Barolo wine tours and Piedmont wine tours. There are also recommendations on Turin food tours, as well as tours in Alba and Asti. Many of the tours to explore the Piedmont wineries are actually private tours, meaning not only a more exclusive experience but a more comfortable way to explore a variety of cities in Piedmont Italy. When looking for Piedmont food tours, we recommend Viator or Get Your Guide, which each have a good amount of options for exploring the Barolo and Piedmont wineries, as well as explore Turin, Alba, and Asti. The easiest way to book tickets online and have immediate tour confirmation is to book with Viator. This allows you to have your trip planned before leaving home. All of the below recommended Piedmont food tours can be booked through Viator.